June 2015 was very significant for the Ukrainian media space. First, main mobile operators launched 3G, high-speed mobile Internet. 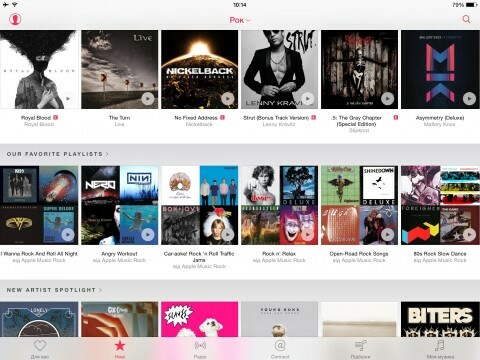 Secondly, on June 30 Apple launched its new service — Apple Music. And Ukraine, luckily to its music lovers, has become one of the countries with access to the huge iTunes database. Below in the article, Noizr Zine evaluates it. 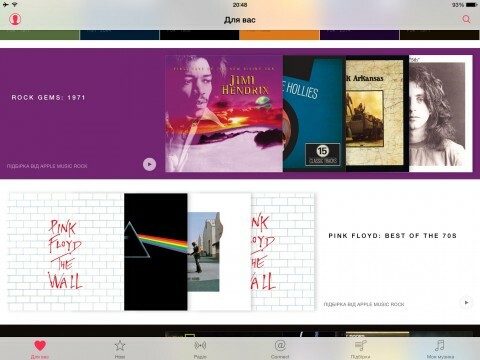 From all the biggest streaming-Music services, Apple is the only officially available in Ukraine. We've previously written about Tidal and were pretty sure that it should come first to our market — after "restarting" it began develop and scale very actively. But no, Apple announced their new offspring quite suddenly, and in less than a month it has officially launched. As for Spotify and Tidal, to test them we had to use a proxy service. Tidal Hi-Fi has streaming in FLAC and HD videos for $19.99/mo. For the sound quality, Tidal wins only with Lossless. However, the difference can be heard by the melomen with a good home acoustics or very expensive headphones in combination with high quality DAC. Furthermore, every album in FLAC takes several times more memory, which is very critical for many mobile devices. In the previous review, we also mentioned the lack of many albums in the service (especially "heavier" music), which is much more serious disadvantage. While testing the service six months ago, it leaves a lot to be desired — during the files synchronizing we often received them in poorer quality (more compressed MP3), the library had a lot of different versions of the same album, caused confusion with covers and much more. It's hard to say that this can be used "unbox" with big pleasure. But again, it works well only on the desktop. The mobile applications, in this case, are not so easy "to pick up and run" will not turn. High Quality MP3@320kbps is available just for paid subscription. In addition, Spotify is not officially presented in our country. In terms of the musical variety, Apple's new service Apple is head and shoulders above Tidal. Within two weeks of using, we found the following advantages and disadvantages of this service. In Apple Music catalog the listener can choose his favorite genres and completely remove uninteresting for him. Since then, the service adapts to the user: a special categorie "For You" manually selects the albums, recordings or videos. And over time, it will suits more and more to your taste. Each time, adding new albums in the library, clicking "like" near the favourite album or post, you'll get more interesting music in the newsfeed. This is really cool working, since such selections are made by people, not by computer. As a result, for several days the author of this article could not stop listening to music. Today it is difficult to find a service that exercises these functions really well. I think, lots of us will remember Last.fm, where on Mayhem's page you can find Furries in a Blender in similar artists. 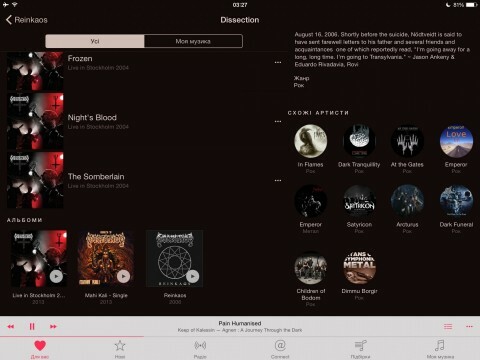 Apple Music, even for so underground genre as black metal, helps to search something interesting from the previously unheard in "Similar albums". The tab "You Might Also Like" offers new music based on the general content of your music library. The applications for iOS are very user-friendly, but they work with some bugs. The web users have complained about inability to get to the library after registration without restarting the application. They also reported that the application could "fall" during browsing and searching (it often happened with us on AC/DC page). But such problems disturbed only by the beginning. On the second week of using everything worked well. The layout of artists' pages also should be noted. They are styled in color, the substrate during playback gain on a album's hue, there is an access to the biography and the full list of releases, etc. 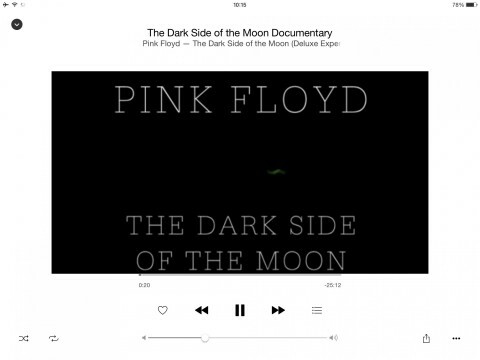 In fact, after the update, we get the same iTunes (12.2+), and advanced application for iOS — Music. The last one was considerably modified, but still quite intuitive. My Music — the major media library and all added files. The categories New, Radio and Connect were almost not tested by us. Connect's feature is that subscribing to the artist (special button 'Follow' in his profile) your newsfeed will update only with future artist's news and after unfollowing — it will remain the old news that is not going away. For now, the sound quality can not be selected, so when you use the mobile network, it will be worse — down to AAC@64kbps. However, with the next update this nuance will be possible to determine in the application settings by yourself. At the moment maximum quality is AAC@256kbps, but it is worth noting that the format has been developed as an advanced MP3, so it can be compared with MP3@320kbps ("blind" tests were more often in favor of AAC in many publications). In general, the synchronization is quite convenient to use. Desktop client application — iTunes — has the same capabilities as a mobile, where you can search/add new music, choose it as an available offline, add to favorites, etc. So after returning home or going out on an own errand, you can open an application on any platform and see the actual library, 'Last Uploads' and continue to listen to the music, which stopped. Applications for other platforms such as Android, will be available soon, according to the announcement. Apple Music subscription price in Ukraine is now listed as $4.99 per month for single, and $7.99 per month for a family up to 6 people (which is beneficial even for two music lovers). After the registration, you get 3 months free using of the service. In the USA, similar rates are $9.99 and $14.99. Due to 3G speed, for many people it's a long-awaited opportunity. If you don't have Wi-Fi connection or files in the media library, you'll be able to play your favorite music, almost at any time. But the traffic price is too high for someone, especially for those, who often use streaming. It is also not entirely clear why this project was carried out in the presence of a high-speed and modern standards with an instant access, such as LTE. Considering the three free months, we can give an advise to lovers of all music genres to try Apple Music, for the categorie 'Similar artists' and other collections in particular. For those who are interested in heavier music (like in our webzine), the only alternative variant is Spotify, but this service isn't officially available yet in Ukraine, so the user have to use it with proxy for the PC and forget for some time about mobile applications.